This is one event he absolutely could not pull out of. 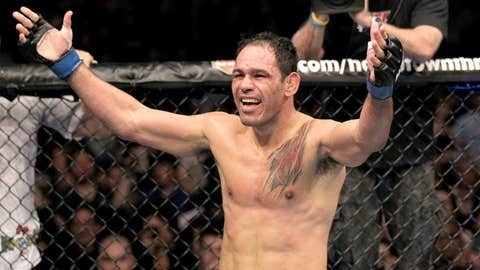 The oft-injured Antonio Rogerio Nogueira was married this weekend in Brazil. Lil’ Nog posted photos of himself and his bride walking down the aisle on Instagram. One of the captions read (translated from Portuguese, of course): "Beside my beautiful wife this wonderful day. May God bless our union." Both Rogerio and brother Rodrigo looked dapper in the tuxedos. Both will be returning to the Octagon sometime in the first half of 2014, manager Ed Soares told MMA Junkie. Lilâ Nog, who beat Rashad Evans in May, was supposed to fight Alexander Gustafsson in March, but turned down the fight, saying he was injured. Rogerio has withdrawn from five fights due to injury since signing with the UFC in 2009. Let’s hope he doesn’t pull a groin before his honeymoon.